I had planned to post my favorite quote from one of my favorite scientists, Richard Feynman, when I discovered that the fine folks at the Sagan Series had already set it to images and music. Its the first passage in the video, and it communicates way better than I could one of the main reasons I love science. Enjoy! I have a friend who’s an artist and he’s sometimes taken a view which I don’t agree with very well. He’ll hold up a flower and say, “Look how beautiful it is,” and I’ll agree, I think. And he says—“you see, I as an artist can see how beautiful this is, but you as a scientist, oh, take this all apart and it becomes a dull thing.” And I think that he’s kind of nutty. First of all, the beauty that he sees is available to other people and to me, too, I believe, although I might not be quite as refined aesthetically as he is; but I can appreciate the beauty of a flower. At the same time I see much more about the flower than he sees. I can imagine the cells in there, the complicated actions inside which also have a beauty. I mean it’s not just beauty at this dimension of one centimeter, there is also beauty at a smaller dimension, the inner structure. Also the processes, the fact that the colors in the flower evolved in order to attract insects to pollinate it is interesting—it means that the insects can see the color. It adds a question: Does this aesthetic sense also exist in the lower forms? Why is it aesthetic? All kinds of interesting questions which shows that science knowledge only adds to the excitement and mystery and the awe of a flower. It only adds; I don’t understand how it subtracts. P.S. Do yourself a favor and go read "Surely You're Joking Mr. 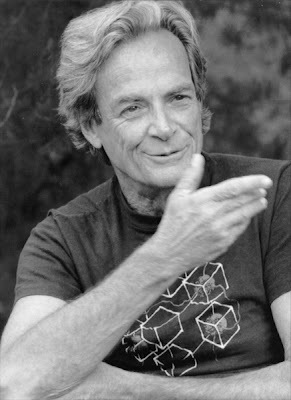 Feynman!" Adventures of a Curious Character. What a great man Feynman was. I am always inspired when I hear his works and quotes. I am paying "blog calls" to each @scio12 attendee to say "Hi" and give your blog a shoutout on twitter (I'm @sciencegoddess). I look forward to meeting you in January! This rules! Inspirational start to 2012.